Making this organic yogurt recipe couldn't be easier! Follow Foods For Long Life on Facebook or Pinterest. 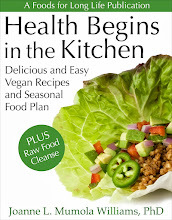 Download my eBook, Health Begins in the Kitchen. When I gave up dairy, yogurt was one of the things I missed the most. Store-bought vegan yogurt is pretty terrible. I remember a while back buying 8 different brands and types in order to do a product review for the blog. They contained all kinds of gums and binders, tons of sugar, and very little yogurt flavor. In disgust, I abandoned the article as I couldn't really find one that I was excited about recommending. I never tried making my own yogurt until I bought my Instant Pot. Although I use it mostly as a pressure cooker, it also works as a yogurt maker. So before I gave up on yogurt completely, with its healthful and critical probiotics, I thought I would give it a try. The first thing you need when making a non-dairy yogurt, is vegan yogurt starter. I use Cultures for Health. Check their website carefully for a coupon. They have other yogurt starters that are dairy based so if you can tolerate a tiny amount of dairy, you can try them too. I imagine that they might give a different flavor and consistency but I haven't experimented with them yet. The vegan yogurt starter is a "direct set" or "single use" starter which means that you should use a new packet for every batch. With the particular recipe and non-dairy milk I am suggesting today, it is possible to make additional batches by using a 1/2-cup of the yogurt and whey from the previous batch. Eventually you may have to use a new packet (I found that using a fresh packet results in a slightly thicker yogurt) although my friend has made countless batches with yogurt and whey from her previous batches and hasn't noticed any differences. Next, you'll need a non-dairy milk. 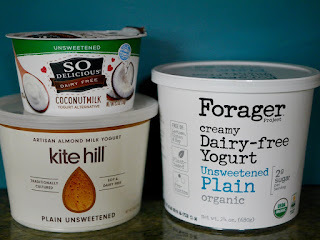 My two favorites so far, that curdle and makes thick, creamy, spoonable yogurt without having to add any thickening agents, are Trader Joe's shelf stable organic unsweetened Soy Beverage and Kirkland's shelf stable organic, plain soy milk. Although the Kirkland's brand is organic and very delicious with just a hint of vanilla, the Trader Joe's product is a healthier choice because it just contains organic soy beans and water. Kirkland's contains other ingredients besides the soy milk like organic cane sugar, tricalcium citrate, sea salt, carrageenan, vanilla, natural flavors, vitamin A palmitate, vitamin D2, riboflavin and B12. Natural flavors can mean lots of nasty things and many nutritionists now recommend avoiding carrageenan because it can cause inflammation. Making yogurt is incredibly easy in your Instant Pot. Stir starter into the milk, pour into jars, set time and hit start! A healthier choice than Kirkland's. 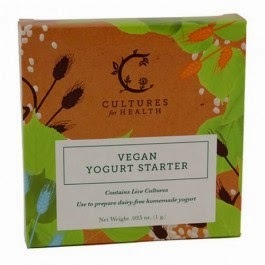 *Cultures for Health Vegan Yogurt starter may contain traces of gluten as they use barley as a nutrient for the probiotic. Clean glass jars with soap and hot water. Dry and set aside. Pour the room-temperature soy milk into a clean pitcher. Sprinkle in a packet of yogurt starter and stir well. If you are using 1/2 cup of yogurt and whey from a previous batch (instead of a packet of yogurt starter), place that into the pitcher first and slowly mix in the quart of milk until it is well combined. Pour into two pint jars. If you have a little left over, pour it into a small taster jar. Place all jars into the Instant Pot. Push the "yogurt" button and set for 8 to 10 hours (the longer, the tangier). You may use the cover that comes with the Instant Pot or a 9" snug-fitting glass lid. I like using a glass lid so that I can see what's going on. Remove when done and place in the refrigerator. Serve when chilled. Tip: Prepare it in the morning so that it finishes in the evening and you can pop it into the refrigerator before you go to bed. Then it will be chilled and ready to use for breakfast the next morning. Per 1/2-cup serving: 50 calories, 2 g total fat, 0.3 g saturated fat, 0 mg cholesterol, 4 g protein, 4 g carbohydrates, 0.5 g dietary fiber, and 55 mg sodium. Per 1/2-cup serving: 45 calories, 2.3 g total fat, .3 g saturated fat, 0 mg cholesterol, 4.5 g protein, 2 g carbohydrates, 1 g dietary fiber, and 43 mg sodium. I have not been successful making yogurt from other non-dairy milks such as almond, coconut, and rice milk as they require a thickening agent. Often, the resulting yogurt is more like Jello than creamy and curdled yogurt. I also don't think they are as tart. Recently, however, I have found some store bought products that are pretty good. Check out my product review on Cashew, Almond, and Coconut Milk non-dairy yogurts. If you want to try making these on your own, your best bet is to use a recipe using Pomona's Universal Pectin. I find that there is no need for the calcium water called for in the recipe if the non-dairy milk you are using has sufficient added calcium. Experimenting with different milks and yogurt starters is fun so if you come up with some great creations, please share them with us! Check out my product review on Cashew, Almond, and Coconut Milk non-dairy yogurts! I have the IP Duo Instant Pot. But if you don't want to invest in another Instant Pot, there are many inexpensive yogurt makers on the market. When using the small jars to make vegan yogurt in the Instant Pot, is it necessary to add any water to the Inner Liner as suggested in the Instructions? I have made it using about a cup of water in the bottom of Inner Liner but it seems to produce condensation on top of yogurt. I was uncertain if the ‘water bath’ creates a more stable temperature for the Yogurt to set or if it’s unnecessary. I have never used water on the bottom of the pot and it comes out beautifully. The only problem I have ever had is when I use certain soy milk products. Thank you Joanne. I will do that with my next Batch. I do use the Instant Pot to sterilize the jars which is easy and convenient. Put it on Steam for 1 minute with 1cup of water and the steamer basket with jars on top. Put on Steam for 1 minute and then NPR to cool. Works great. But no longer than 1 minute or the Jars might break. (had that problem). Hi there neighbor! So glad you are enjoying your instant pot. Every day I learn something new about it. I actually just went out and bought another one as I sometimes want to cook two things at once. I only wish this was invented years ago. Wonderful recipe and details! Sadly, My IP does not have a YOGURT setting. Do you have any work-arounds you can suggest to accomplish the same ends on this lovely recipe? The jars need to be at 100 degrees for at least 8 hours. Do you have a crock pot with a very low setting or a dehydrator? If you have a gas oven with a pilot light, your oven might be warm enough to make yogurt. Whatever you try, use an oven thermometer to make sure it's the right temp. If it's too warm, it will kill the culture. You can also buy a yogurt maker for under $25. Here's one on Amazon (I've never tried it but it has some good reviews) https://www.amazon.com/gp/product/B000EX16RY/ref=s9_top_hd_bw_b15BUL_g79_i1?pf_rd_m=ATVPDKIKX0DER&pf_rd_s=merchandised-search-2&pf_rd_r=F8SV9BPHH89VBBQ66EEA&pf_rd_t=101&pf_rd_p=2222954862&pf_rd_i=16012141. I have my thermometer ready and am going to try using an adjustment recipe I found which suggests putting the jars in the IP, using the "keep warm" function for 15 minutes (which should bring it up to temp), then turning the unit completely off for 10 hours (sealed lid). The good news is that ingredients are inexpensive enough to allow for a bit of trial and error experimentation! Great idea. Let me know how it turns out. Hi, I don't digest soy well, any chance you've experimented with Coconut or Almond milk yogurt? I haven't but most of the non-soy yogurts require something else to make them gel, like Pomona pectin, besides the yogurt culture. Check out the Culturesforhealth website. Here's their recipe for almond milk yogurt http://www.culturesforhealth.com/learn/recipe/yogurt-recipes/vegan-raw-almond-milk-yogurt/. Have you tried either WestSoy Unsweetened Soy Milk (Vanilla or Plain) or Eden Organics Unsweetened Soy Milk? 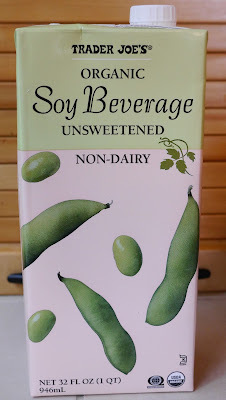 Both brands only contain water and soybeans (plus vanilla for the Vanilla WestSoy) and they contain more fat and protein than other soy milks which makes me think that they'd curdle really well. I don't think I've tried them. If they work for you, let us all know! It's certainly more healthy to use the ones with just organic soybeans and water. I thik the reason you don't need a thickener is that there is maltodextrin in the Culture for Health Vegan culture you mention and maltodextrin is a thickening agent. I used a probiotic pill that I have and it wasn't very thick... not real runny either. I'm thinking of adding maybe a teaspoon of arrowroot and shaking it up along with the probiotic. Thoughts? I'm not sure why they add it. I just sent them a note to see if it's for thickening or, perhaps, for the initial food source of the bacteria. In either case, it comes out delicious. I tried making yogurt with a probiotic pill and it came out terrible. The addition of arrowroot would probably make it come out like gelatin. Are you allergic to maltodextrin? FYI, I've experimented with yogurt with various vegan milks and what I found was that the ones with 9g of protein per serving work well and anything with less doesn't do so well. Trader Joe's has 9g and that is all I use (because it is cheap). Most of the others have 7g or less (except for a few expensive ones), the non-soy ones tend to have much less. I use a 1/2 cup of yogurt from my last batch to start the next. Trying my first batch with my new instant pot, have been making it with a yogurt maker (but it requires really small containers which is a pain if you happen to break them!). I totally agree that the higher the protein, the more structure the resulting yogurt has. I've also experimented with a few more brands. Edensoy has 11 g and Westsoy has 9 and they both work very well. Kirkland organic soymilk, which I originally favored, only has 8 and works very well but has a bit of carrageenan that helps it along. I stopped using that one because it had too many ingredients. I now only use ones that have soybeans and water. I've used Edensoy successfully but here it is $4 for a carton versus $1.80 for trader joe's! Thanks for your instructions, so simple. Sounds like Trader Joe's is a bargain! It's organic too! Perhaps this is a silly question, but do you put lids on the jars while they are cooking away in the IP? I want to make sure I do it right. My husband can no longer eat dairy and I really want to make this for him! I leave them open while they are in the IP. After they are done, I generally let them cool to room temperature before putting the kids on and placing them in the refrigerator. I'm sure your husband will love it! Oops- I meant LIDS, not KIDS. Please do not place your kids in the refrigerator 😊. You don't have to heat the milk first? Every yogurt I've ever made has involved heating, and then cooling, the milk. I have never heated the milk and it comes out perfectly. Have you tried making this yogurt with homemade nut milk that only contains nuts and milk? The commercial products use thickening agents. My IP arrives tomorrow and I want to make vegan yogurt this weekend. I've never tried it but there are several ways to do it. You can use Pomona Pectin to thicken it. Here's a recipe for almond milk yogurt: http://www.culturesforhealth.com/learn/recipe/yogurt-recipes/vegan-raw-almond-milk-yogurt/. And here's a recipe for hemp milk yogurt http://www.culturesforhealth.com/learn/recipe/yogurt-recipes/hemp-milk-yogurt/. Some people use a thick homemade cashew milk with probiotic cultures without the thickeners. I haven't tried any of these yet. It's fun to experiment!